The intersection of Parry, Adelaide and Queen Victoria Streets will be upgraded to improve safety and facilities for cyclists and pedestrians. The State Government today announced the 2018/19 recipients of the WA Bicycle Network Grants program, with $175,000 allocated to the busy intersection in Fremantle’s East End. The grant matches funding by the City of Fremantle for the $350,000 project. Plans for the upgraded intersection feature “head start” zones for cyclists, and clearer demarcation of cycle and vehicle lanes. Pedestrians are also set to benefit from improved access and crossing points with pram ramps, walk/don’t walk lanterns and push button activation. The upgrade will improve safety and connectivity in a rapidly growing area of Fremantle which will continue to see increased residential and commercial development. 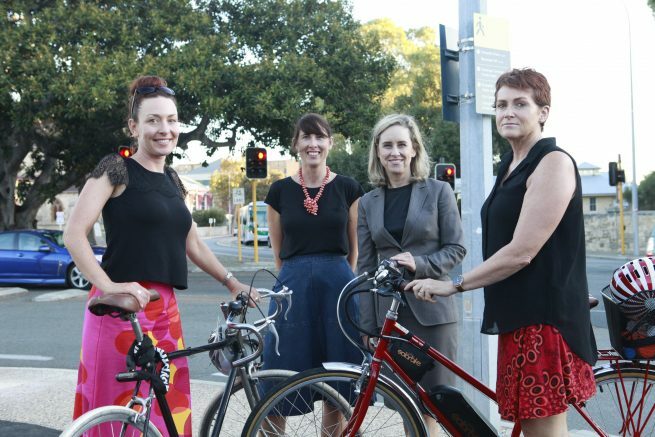 “Anyone who has tried to cross this busy intersection on their bike or on foot knows just how dangerous it can be,” said State Member for Fremantle Simone McGurk. Dr Brad Pettit – Mayor of City of Fremantle – said, “Fremantle is on its way to becoming one of Australia’s most bike-friendly cities so we thank the state government for including us in the latest round of Perth Bicycle Network funding.